A simple, economical demonstration of your window or film's energy performance. Check out this demonstration of the HEAT-SHEET® Temperature Demonstration Card. 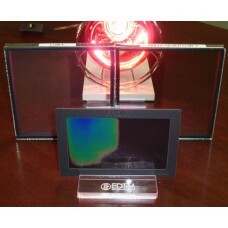 The HEAT-SHEET® Temperature Demo Card vibrantly changes color when it encounters heat. To demonstrate the heat-blocking capabilities of your glass or film, use the HEAT-SHEET® Card in combination with a Heat Lamp. The visual demonstration makes a great addition to the tangible performance data shown with many of our other sales tools. The demonstration shows a dynamic color change in front of an energy ineffecient window sample while no color change occurs when placed in front of your energy efficient window. The demonstration shows the customer that your window or film will reduce heat transfer that occurs as a result of radiant energy, conduction, and convection. See it in action below. An optional Acrylic Base is used in the video. See information about the Acrylic Base and other demonstration accessories by clicking here. Replacement Bulb for HL2040 Infrared Heat Lamp with Flip-Up Base The Infrared Heat Lamp is an essential part of a successful sale. The sun's radiation accounts for 70% of your customer's heating and cooling bill. Sell the concept of a .. Replacement Bulb for HL2040 Infrared Heat Lamp with Flip-Up Base The Infrared Heat Lamp is an essential part of a successful sale. The sun's radiation accounts for 70% of your customer's heating and cooling bill. Sell the concept of a hot su.. Replacement Bulb for HL1040 Infrared Heat Lamp The Infrared Heat Lamp is an essential part of a successful sale. The sun's radiation accounts for 70% of your customer's heating and cooling bill. Sell the concept of a hot sun (Heat Lamp) being ..
© Copyright 2019 Electronic Design to Market, Inc. All rights reserved.